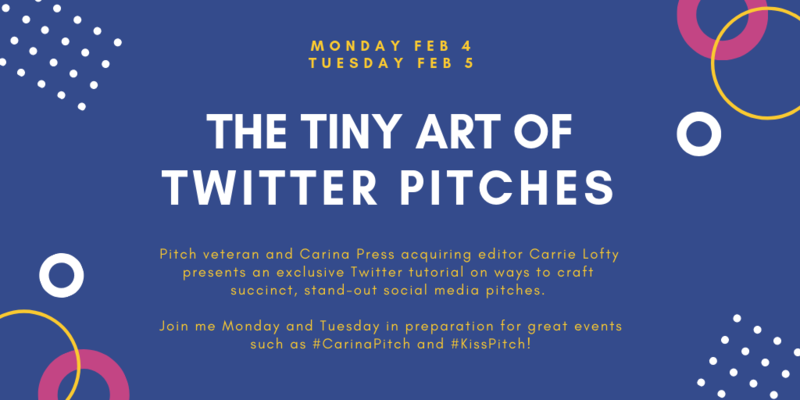 Join me February 4-5 on Twitter to prepare for great online pitch opportunities such as #CarinaPitch and #KissPitch. I’ll be sharing tips, methods of organizing ideas, shortcuts, helpful hashtags, and a lot of examples. I’ll also be answering questions in real-time. A little background: I’ve taught a workshop called “The Tiny Art of Elevator Pitches” (and its various permutations) more than two dozens times since 2008, from RWA Nationals to local chapters and writers’ groups. I’ve also been in the shoes of a hopeful author, waiting to spend eight really important, ridiculously nerve-wracking minutes across the table from agents and editors I desperately wanted to impress. So, I hope you’ll join in on February 4-5. Let’s make this a great year for your online pitching ambitions. It’s free and hopefully it’ll be helpful. Find me on Twitter and follow hashtag #PitchWitch. Disclaimer: Although I am a freelance acquiring editor for Carina Press, my opinions are my own. Participation or advice does not guarantee editor or agent interest. All example pitches have been released by their authors for educational purposes.